For some crazy reason, I can't explain, when we had our lobster boil for the Fourth of July... we had "leftover lobster". That has never happened before but there it is. 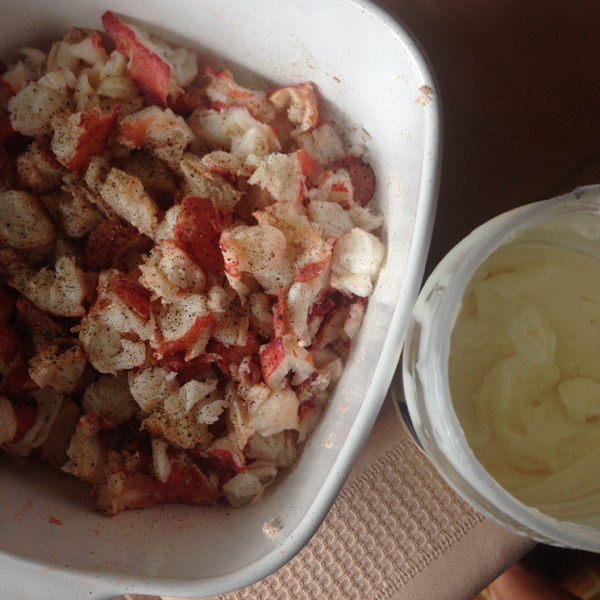 It did seem like a great chance to make lobster rolls. As with so many of these dishes that have a following, there are multiple sources as to where it originated from. Wikipedia says "The lobster roll was originated at a restaurant named Perry's, in Milford, Connecticut as early as 1929." This site offers up "Many Mainers view Bayley's Lobster Pound at Pine Point as the inventor of the famous seafood sandwich." If you have never had the delight of enjoying one, a lobster roll is basically lobster salad served in a bun. That is a very basic definition. There are a lot more particulars that some feel are absolutes. For instance, the bun should be a New England style - like a hot dog bun but sliced on top rather than the side. The bun should most definitely be toasted. Then there is the debate over whether the lobster should simply be doused in butter only or mixed with mayonaise and other additions such as lemon juice, celery, scallions, paprika, pepper or Old Bay. Right or wrong, I made our lobster rolls the way I most enjoy it. Cold lobster, mayo, lemon juice, pepper, celery, and Old Bay served in a toasted New England style bun. I would like to make lobster rolls again soon... like Martha Stewart featured... in pull apart dinner rolls. Yum. I've heard that some McDonald's locations are offering lobster rolls on their menu. I have to say I would try it at least once.